Faith's Temptation. Faith and Vamp Buffy caught at sunrise. HD Wallpaper and background images in the Buffy vs Faith club tagged: faith buffy slayers. I like the new arts. Haven't got a chance to log on for a while. Thanks Faith. 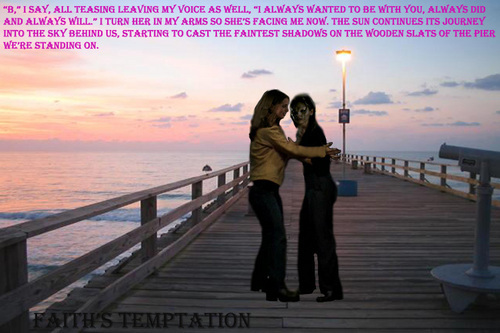 I'm playing with a few more manips while I finish posting the Faith's Temptation story. BTW- you gonna post soon? I'd like to see more of these manips, Lupo, and to read your story, so please don't ever take it down... I'm a fan of it! I hope to find all of them, Sir, and to see more of your high-quality fanart that you've been making, and I'm glad to have reminded you of these being here.